I think you have completely lost your mind, my friend. I can hook you up with a therapist I know. LOL! I won’t argue with your assessment! I went to hunt a soccer field the other evening. It was 98 degrees and the sun was full on. After an hour of swinging my 4 pound V3i I was out of juice! 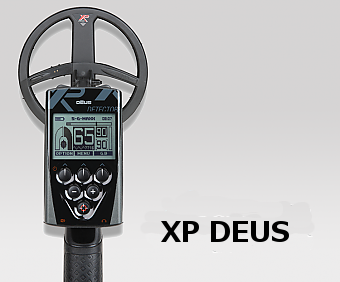 I had been thinking of trading my V3i for an XP Deus for some time now. Turns out the XP Deus was a little more expensive than i thought, so I had to sell my other two detectors to make the price. I’m having seller’s remorse but I’m going through with it. BTW, I won’t have a machine to hunt with for another week! Hopefully compadre#1 makes ig here quickly. Maybe Patton has an F2 you could borrow! Wait… No cause then you would possibly convert to a fisher man! LOL Steve! Fortunately, the Compadre is coming on Wednesday or thereabouts. I was thinking your not the kind to put all of his eggs in one basket. I predict your “one metal detector fits all” approach won’t last long. 🙂 Has the Deus been out long enough to have a proven track record? I have just seen them advertised in magazines in the last couple of months. Not saying you haven’t done your homework. I know better than that. ha ha ha! Well you know, rumor has it that the folk at Fisher are working on a new detector that will revolutionize the industry. I am putting the XP to work overtime to get me that detector when it comes out! That or the people at Blisstool may modify their machine so we can use it on parks. The Blisstool is the deepest machine bar none and it has proven it time and again. It’s just not made for parks. Plus I still really want an AT Gold.